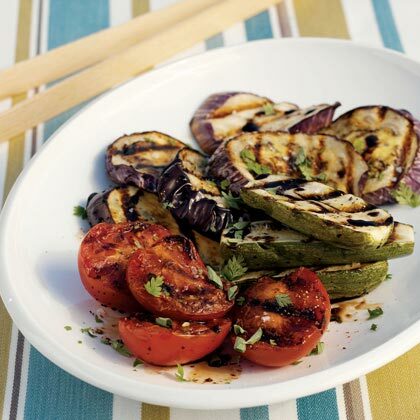 This basic method for grilled eggplant, tomatoes, and zucchini works for other vegetables too, including green onions and halved bell peppers. In a large bowl, dissolve 2 tablespoons salt in 3 quarts cold water. Add eggplant slices and weight with a plate or inverted bowl. Let sit 30 minutes. Meanwhile, prepare a charcoal or gas grill for medium-high heat (you can hold your hand at grill level only 3 to 4 seconds). Drain and dry eggplant. Lay vegetables on a platter. Brush one side with olive oil and sprinkle with salt. Brush grill with vegetable oil. Lay vegetables on grill, oiled side down. Close lid of gas grill and cook until grill marks form, about 5 minutes. Brush dry side of vegetables with olive oil and sprinkle with salt. Turn over, close lid of gas grill, and cook until tender, 3 to 5 minutes. Serve vegetables hot or at room temperature.